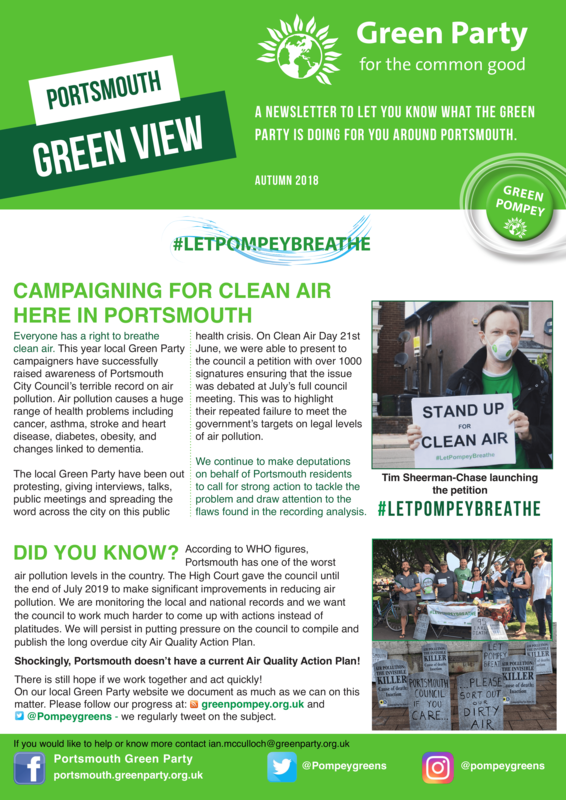 Get news and events from the local Portsmouth Green Party, watch videos on Green issues relevant to the local area and find out how to get involved! 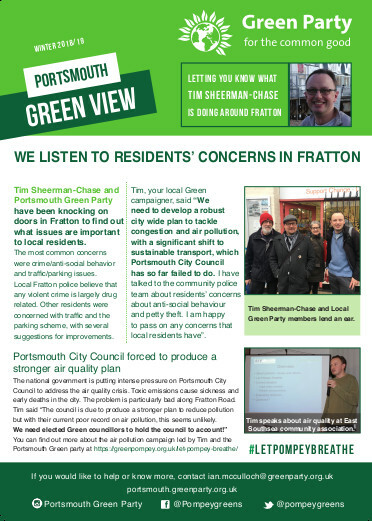 Or, for the very latest up-to-the minute information about the local Party's work, sign up to our newsletter, find us on Facebook, or follow us on Twitter and Instagram. 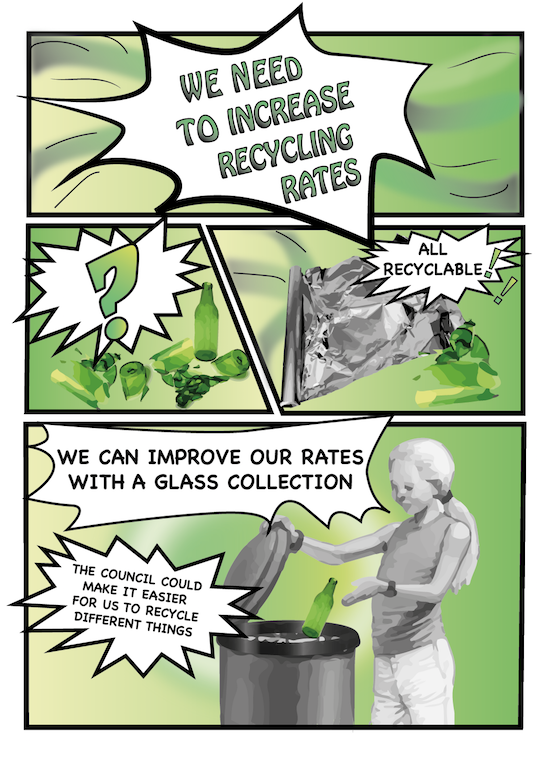 Our members also maintain a recycling blog Shades of Green. You can support us by donating, volunteering, voting, switching energy providers or recycling through our partner schemes. 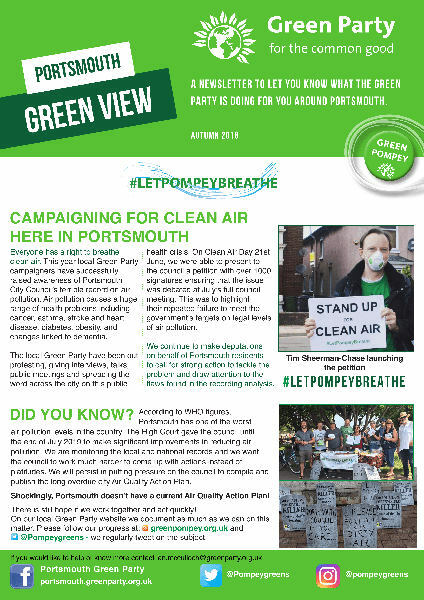 We are spearheading the #LetPompeyBreathe air quality campaign. 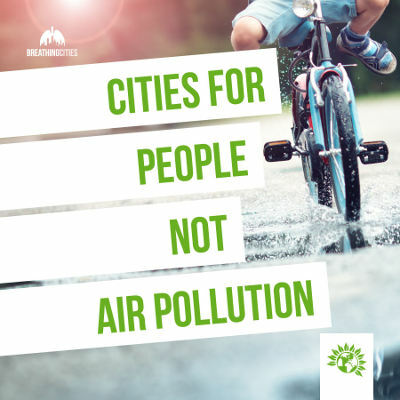 Greens are getting together to highlight the importance of reducing transport-related air pollution - not only for our health, but also for our environment and for the fight against climate breakdown. The government is proposing to cut £8,052,952 from Portsmouth schools, which is equivalent to 216 teachers, according to the National Union of Teachers. That means fewer teachers, bigger class sizes, less support staff, fewer resources and some subjects scrapped. If you are a parent of a child in a school in Portsmouth, you can ask your headteacher about the budget cuts that the school is facing and what measures the school plans to take to cut their costs, or search for specific school on schoolcuts.org.uk. The local party have released a press statement to express our extreme disappointment and dismay at the contents of the document, the lack of strategy and the scarcity of any consultation process so far. We would recommend you to take a look at the PCC Air Quality strategy document and the contrasting one from the Greater Manchester Area so that you can raise and contribute as you see fit to the response section of the Portsmouth City Councils portal. 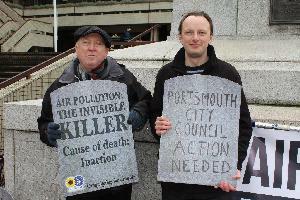 Here is the link to the Portsmouth Air Quality Strategy document and survey. You can access the Greater Manchester Air Quality Action Plan here for comparison. The deadline to complete the survey is 9am on Monday 8th May, 2017. You MUST get your response in by then, but we recommend you submit it by Sunday evening. 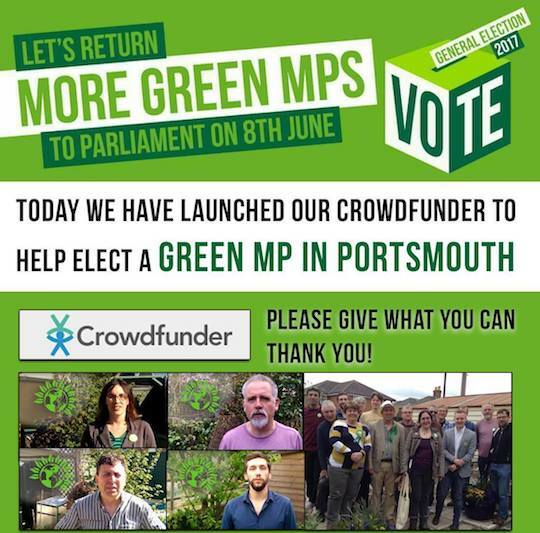 We have launched our crowd funder to Elect a Green MP in Portsmouth. We are not funded by big business and we do not have the enormous funds that other political parties have. That is why we need to ask for your support. 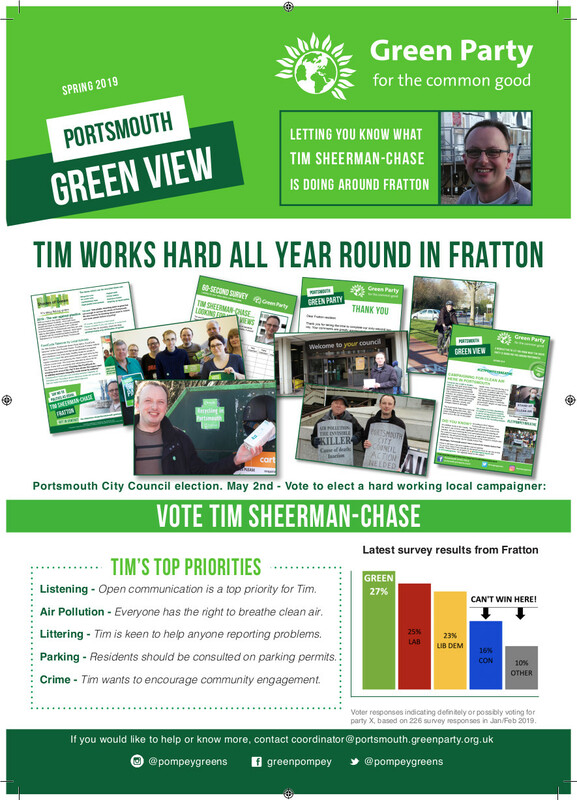 We will work hard to represent the people of Portsmouth with your help! 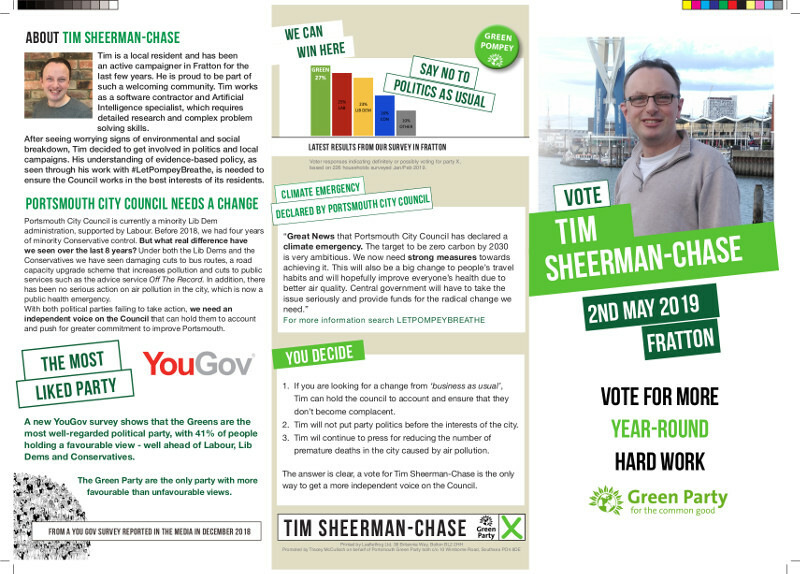 Go to crowdfunder.co.uk/help-elect-a-green-in-portsmouth to give what you can and support our campaign! It seems a while since I started on 'our green patch' at the Southsea Green space (opposite Canoe Lake). 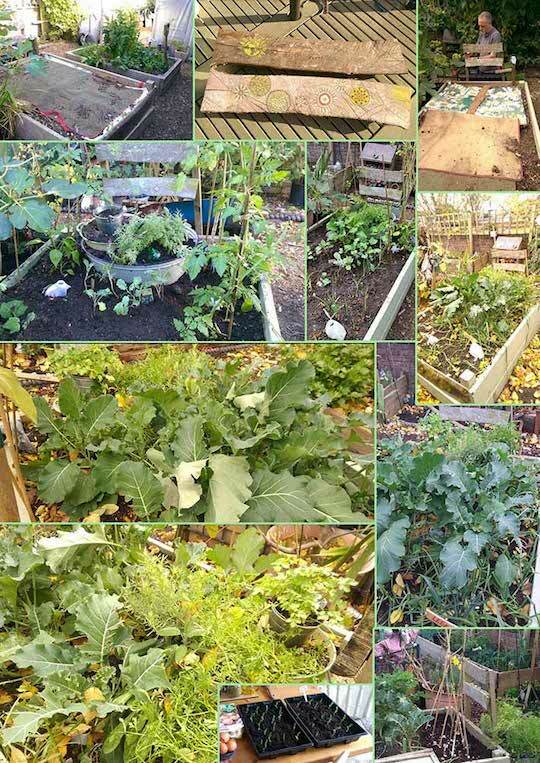 When we were offered a patch we had little idea of what we were going to plant and a bit of a mix of experience of vegetable growing. What we did have is some enthusiasm to just dive in and have a go at it. I have always loved gardening and in the past I have successfully had a garden full of veg, but that was way in the past. Apart from a few tomatoes and a fig tree and some lovely herbs I had not grown anything other than flowers. We made a trip out to a friendly horse stables in Denmead to get 'some good poo'. We added in some organic mulched compost and dug it all in to the patch that had been left for a while and looked a bit dry. I painted some signs and some green insignia around the outside edge and we were ready to go. Soon we were planting up courgettes, leeks, a herb garden with sage, rosemary and cress, purple sprouting broccoli, garlic, spring onions and peppers. Jo installed a watering system of old plastic milk cartons with holes in so that we could keep the soil moist more constantly when its hot and the ground gets dry . Within a short space of time our patch was looking really healthy and although we had some casualties along the way, the vast majority of plants grew and kept on growing. During the winter months we have not visited so much but our plants still look healthy and thriving. Southsea Green (map) also serves a very different purpose, not just to tend your veg and dig the ground, but also to form friendships with the others in the garden. There are times when you can meet up and swap seeds and bulbs, taste each others produce and get gardening tips. The space is a really nice place to meet up (especially when the sun is shining) and I hope to get down there with the group a lot more in the coming months. I only wish we lived a little nearer and we would be watching the crops a little more constantly. This week I visited again to plant some pea seeds that have all come along very nicely in my shed for the past 3 weeks. Looking forward to a little harvest of broccoli soon and maybe some sweet smelling wild flowers. 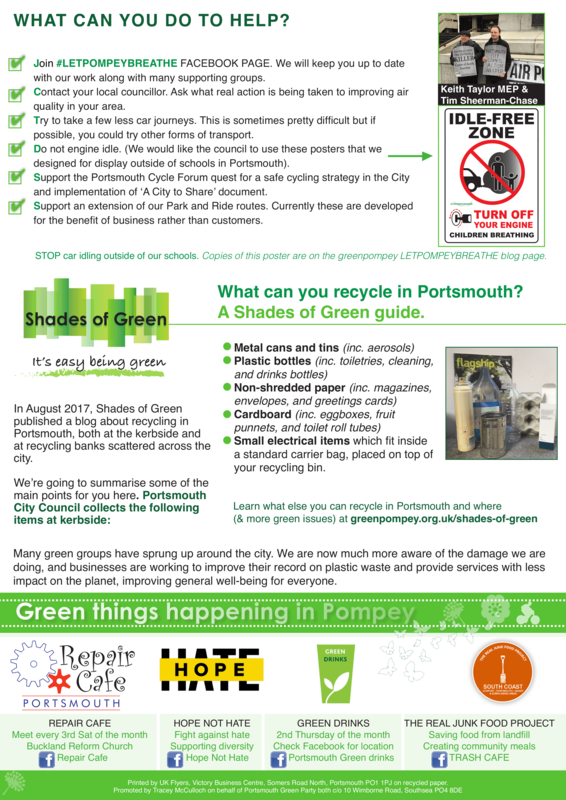 Portsmouth has one of the lowest recycling rates in the country, coming in at 345 out of 352 authorities. 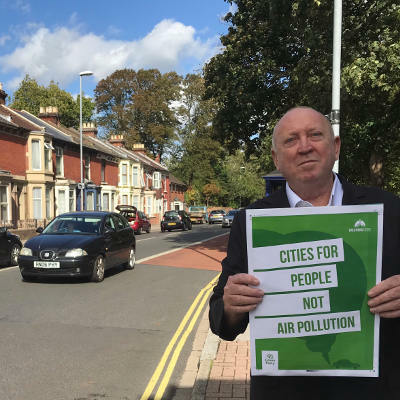 That's in the top 10 WORST councils! 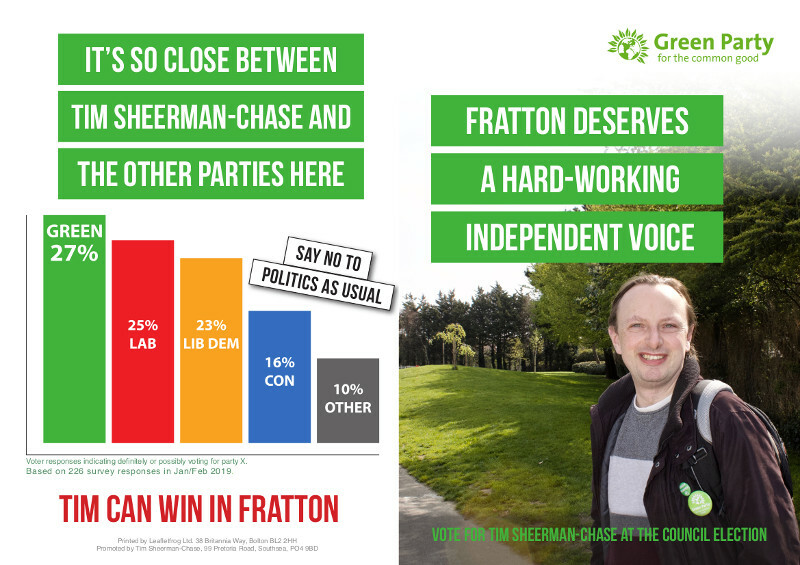 We need to do something about it... just one of the reasons we need the Green Party represented on the council. To find out how you can help, go to Donate, or get in Contact!